The purpose of the Best Practice Guideline Implementation to Reduce Falls in Older Adults is to increase all nurses' confidence, knowledge, skills, and abilities in the identification of older adults within health-care facilities at risk for falling and to define interventions for the prevention of falling. Falls is a major health concern in older adults causing physical injury and psychological impacts resulting in hospitalizations. In Canada, 95% of hip fractures and 85% of injury-related hospitalizations in older adults are due to falls. The annual direct health-care costs are estimated to be $2 billion CAD due to falls, and older adults account for nearly half of these costs. Aim: To examine changes in health outcomes associated with the implementation of the RNAO best practice guideline (BPG) Prevention of Falls and Fall Injuries in the Older Adult (2011),in two hospital-based Best Practice Spotlight Organizations (BPSO)®. Measure: Rate of falls per 1000 patient days from 2012 to 2016 using the Nursing Quality Indicators for Reporting and Evaluation (NQuIRE)® data system. Clinical improvement: A decrease in the number of falls in hospital BPSOs, as a rate of the number of patient days. 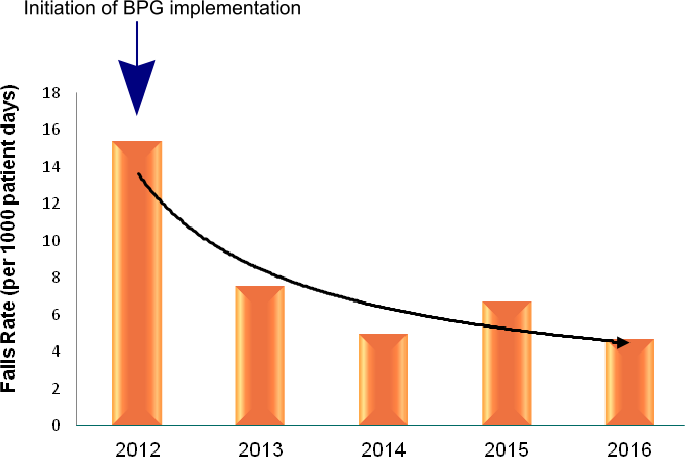 Between 2012 to 2015, this Ontario hospital BPSO-I fully implemented the RNAO guideline across the organization. Implementation activities included: training for staff, patient education, falls screening, a post-fall documentation tool, purposeful rounding, and posters at the bedside with patient transfer requirements. This BPSO purchased low beds as recommended and used falls stickers to indicate patients at risk of falls. An organization-wide policy was developed to guide prevention of falls and fall injury. 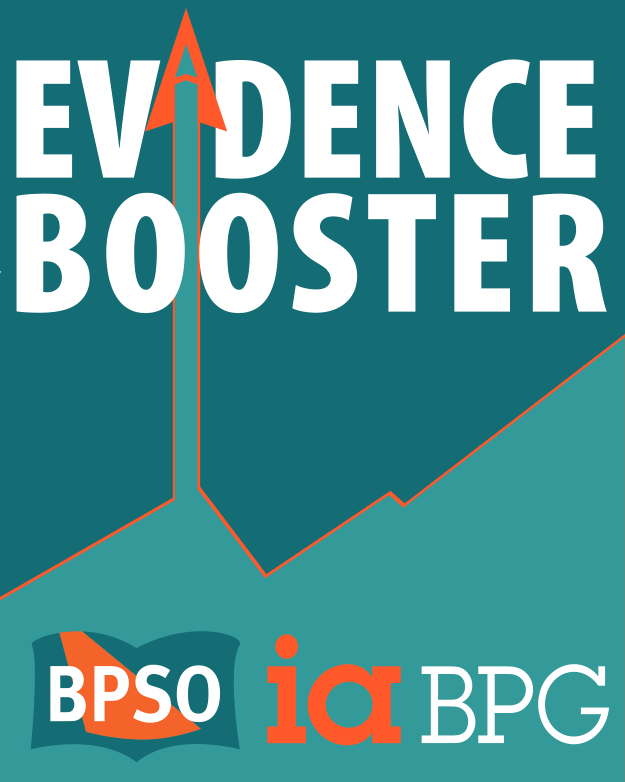 Since 2015, this BPSO has sustained the implementation activities and outcomes have remained steady. 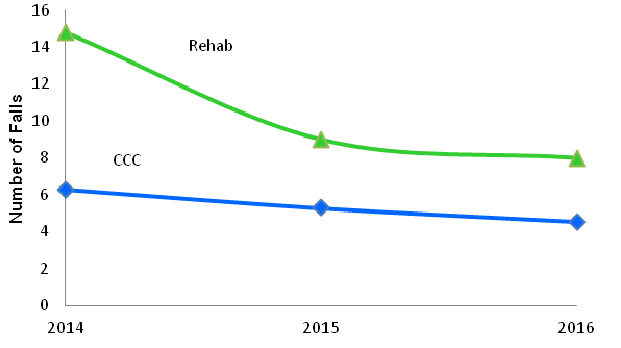 Impact: The number of falls decreased by 46% (14.78 to 7.98) from 2014 to 2016 on the Rehab unit and by 28% (6.28 to 4.51) on the CCC unit (see Figure 2). The Ontario hospital BPSO-II implemented this guideline within their rehabilitation (Rehab) and complex continuing care (CCC) units. Implementation activities included: daily fall risk assessments, armbands to alert patients to ask for help, referrals to interprofessional team members, post-fall nursing assessment, and changes to electronic documentation to reflect practice changes. Education materials were developed for staff and patients. An algorithm related to falls and fall injury prevention was developed for nurses and other health-care professionals. 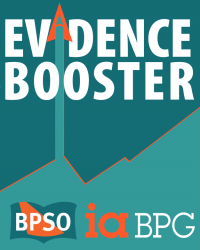 BPSO-II established a Falls Working Group to further implement best practices and monitor impact.